Mitral valvular disease can be categorized as either stenotic or incompetent, albeit a third or more of patients present with both lesions. Mitral stenosis (MS) represents a pressure overload condition; whereas, mitral insufficiency or mitral regurgitation (MR) represents a volume overload state. As such, the pathophysiology and clinical manifestation, as well as management, can differ significantly between the two lesions. The prevalence of MS in the United States has declined significantly over the past decades, with the majority of patients presenting for mitral valve surgery born outside of the United States. The etiology of MS include mostly acquired rheumatic infection during childhood or during early teenage years, bacterial endocarditis, congenital causes or, rarely, tumors and blood clots that can obstruct or impede blood flow from the left atrium (LA) into the left ventricle (LV). Last, inflammatory response with calcification from radiation or from certain drugs can result in MS. The causes of MR are many and are best approached from an anatomic origin: leaflet, annulus, papillary muscle, chordae, and ventricle (Figure 1). Anatomy of the mitral valve depicting all components that participate in normal coaptation. Pathology in any single or more components can lead to mitral insufficiency. Leaflet causes can be classified as infectious (rheumatic, endocarditis); connective tissue disease (Marfan syndrome, Ehlers-Danlos syndrome, systemic lupus, rheumatoid arthritis, scleroderma, etc. ); and congenital. Annular dilation is a common etiology of MR as is ventricular dilation from ischemic and nonischemic cardiomyopathy. Chordae elongation (connective tissue disease), fibrosis (rheumatic disease, radiation, endocarditis), and rupture can alter leaflet coaptation leading to MR. Lastl, papillary muscle ischemia, infarction, and rupture are known causes of MR. While MS is almost always a chronic process occurring over decades, MR can be both acute and chronic. Type I: Characterized by normal leaflet motion. Since leaflet motion is normal, MR may be caused by either annular dilatation, resulting in an inadequate coaptation surface, or by mitral valve leaflet perforation, as seen in cases of endocarditis or congenital mitral clefts. Type II: Characterized by increased leaflet motion. The free tip of the leaflet moves above the mitral annular plane during systole (mitral valve prolapse). Type IIIb: Characterized by restricted leaflet motion in systole only. This type of MR can arise from papillary muscle dysfunction due to ischemia or dilated cardiomyopathy. Leaflets are tethered inferiorly and posteriorly by ventricular dilatation, leading to mitral regurgitation. Leaflets open normally during diastole. The pathophysiology of MS should be approached similarly as other stenotic lesions (aortic stenosis, pulmonic stenosis, and tricuspid atresia). That is, with progressive narrowing of the valve orifice (Figure 2), the ensuing pressure gradient rises between the prechamber (LA) and the post chamber (LV). The ensuing pressure overload is transmitted “backwards” from the atrium to the pulmonary veins, pulmonary capillaries, pulmonary arteries, right ventricle, right atrium, and the central venous system. Mitral stenosis showing the characteristic rheumatic involvement of the commissures and leaflets, as well as significant calcifications. The presiding symptoms in these patients include shortness of breath, fatigue, and decreased exercise tolerance from congestive heart failure (CHF), with hypoxemia and symptoms of right heart failure developing in the late stage of MS. In MR, concerns may differ as to whether the lesion is acute versus chronic. Acute MR generally occurs in the setting of myocardial infarction and/or as consequence of rupture of chordae or papillary muscle, usually with a “flail” leaflet component (Figure 3). In such cases, the typical adaptation processes seen in chronic MR do not occur, and acute LV dilatation can be associated with both systolic and diastolic dysfunction, florid pulmonary congestion, and cardiogenic shock. Severe mitral insufficiency with an eccentric jet overriding the posterior mitral leaflet. This is typical of a flail or a prolapse defect involving the anterior leaflet. In chronic MR, the initial adaptive response is for the ventricle to hypertrophy. As the MR worsens, the regurgitant volume increases – raising LA pressure, which, in turn, causes similar symptoms as chronic MS (fatigue, shortness of breath, CHF). Secondary pulmonary hypertension and right heart failure are late features of chronic MR. Figure 4 shows a pressure-volume loop for MR.
Pressure-volume loop of chronic mitral regurgitation, showing an enlarged chamber with excessive end-diastoic volume (shaded area) compared to a much smaller left ventricular dimension (nonshaded area), corresponding to normal LV volume. Almost always, mitral valve surgery is performed as an elective case. However, in settings of either acute MR or acute on chronic MR associated with cardiogenic shock or impending end-ogan dysfunction unresponsive to medical therapy, the procedure is done urgently or emergently. On the other hand, minimally invasive mitral valve surgery (MIMVS) is always performed as an elective procedure and rarely performed urgently. Both the surgical and the anesthetic techniques and equipment differ from standard approaches and attempts to perform such procedures under emergent conditions would add significant risk while compromising the repair or replacement. In the setting of acute MS exacerbation with significant hemodynamic and respiratory abnormalities, emergent/urgent traditional surgical approaches are also warranted. While surgical repair/correction provides the definitive treatment, equally important is the perioperative medical management of all associated coexisting diseases such as CHF, reversible lung disease, hypertension, coronary stenosis, diabetes, and renal dysfunction. The postoperative recovery is directly linked to preexisting end-organ dysfunction. Therefore, for either lesion, MS or MR, the preoperative assessment should consist of a thorough evaluation of the heart with respect to biventricular function, coexisting valvular lesions including severity, chronicity, and corresponding pressure gradient calculation, left and right heart catheterization for characterization of coronary disease and pulmonary hypertension, and a comprehensive review of systems, of laboratory studies, and of all pertinent radiographic imagings. Pulmonary functional status evaluation as well as airway assessment are critical for MIMVS because of the need for one-lung ventilation. As in any major cardiac surgery with the aid of cardiopulmonary bypass (CPB), the coagulation status of the patient and appropriate preparation for bleeding and correction of coagulopathy must be carried out. Congestive heart failure: This can be evaluated by a number of modalities, including clinical (history, physical exam), laboratory (beta naturetic peptide), and imaging (chest X-ray or CT scan of chest). Coronary artery disease (CAD): A significant number of patients with MR have advanced CAD and require coronary angiography prior to surgery to determine whether there is a need for concomitant coronary artery bypass graft (CABG) surgery. In fact, a significant cause of MR is ischemic heart disease. Atrial arrhythmias: Most often, these patients present with chronic atrial fibrillation (AF) that is treated with anti-arrhythmics as well as an anticoagulant(s). It is important to evaluate for this and any other electrophysiologic (EP) condition (pacemaker, implantable cardioverter device [ICD]) by obtaining an ECG or detailed history about prior EP studies and interventions. Ventricular function and coexisting valvular pathology: In late stages of MS, right ventricular (RV) dysfunction can be present and should be evaluated by echocardiography. Similarly, with advanced MR, LV dysfunction may be present and frequently masked because of unloading into the LA during systole. Echocardiographic evaluation for this dysfunction and other coexisting valvular pathology is important. For example, the presence of aortic insufficiency often excludes patients from having MIMVS because it would compromise delivery of cardioplegia and cause ventricular dilation during the procedure. Unstable cardiovascular status due to mitral valvular disease requires aggressive medical therapy involving treatment of CHF with oxygen supplementation (sometimes endotracheal intubation), diuretic therapy, afterload reduction, and inotropic support as indicated. In acute MR or in acute-on-chronic exacerbation of MR with cardiogenic shock, an intra-aortic balloon pump (IABP) is often necessary. Hypertension: Systemic hypertension is a very common comorbidity that affects nearly two-thirds of older persons. Systolic hypertension predominates in this age group and should be optimally reduced in patients with MR to promote forward flow and to lower the regurgitant volume. Airway assessment for difficulty with intubation is particularly relevant for MIMVS. Placement of a double lumen tube for one-lung ventilation may be technically difficult or impossible to accomplish in patients with a limited mouth opening, anterior larynx, and/or anatomic features known to complicate standard intubation. Should the clinician elect to proceed with MIMVS, all necessary airway adjuncts need to be gathered (fiberoptics, bronchial blockers, etc. ), with the assistance of an experienced colleague to ensure safe and successful intubation. Assessment of pulmonary function test is indicated in patients known to have a history of COPD, asthma, emphysema, restrictive lung disease, or other underlying conditions that may significantly impact postoperative respiratory failure – compromising weaning from mechanical ventilator. COPD: Because congestive heart failure is so prominent in both MS and MR, any additional preexisting pulmonary condition can have a catastrophic effect on oxygenation and ventilation. Thus, a comprehensive evaluation of the pulmonary status to include pulmonary function studies with and without bronchodilator responsiveness, discrimination between primary pulmonary versus extrapulmonary involvements (a CT of chest is often needed), and preoperative optimization to include bronchodilators, incentive spirometry, and treatment of pneumonia and bronchitis that may be present. Reactive airway disease: As with COPD, asthma work-up should involve the aforementioned processes. Of note, asthma is not as prevalent in adults presenting with mitral valve surgery and, in many cases, symptoms attributed to it and to COPD (wheezing) may be primarily cardiogenic (CHF) in nature. The value of a baseline arterial blood gas analysis in either COPD or in asthma is debatable but should be performed in advanced stages of lung disease. Secondary pulmonary hypertension: This condition can be assessed indirectly by echocardiography; however, more precise measurements can be obtained from a right heart catheterization, allowing pulmonary artery pressure (systolic, diastolic, and mean) measurements. Coexisting renal dysfunction may be acute in nature from poor cardiac function associated with mitral valve disease or chronic in nature from cardiac disease or from other common causes to include hypertension, diabetes, and glomerulonephritis. Volume overload is common in these patients and most require aggressive diuretic therapy prior to surgery. In limited cases, acute kidney injury may arise from either an exacerbation of heart failure or from other causes, such as nephrotoxins (iv contrast used during preoperative coronary catheterization and ventriculography). For patients with end-stage renal disease who require dialysis, it is important to coordinate with a nephrologist/dialysis service to dialyze the patient within 24 hours of surgery. In such cases, profound anemia is always present and appropriate amounts of blood products should be available, including red blood cells, platelets (uremia-related platelet dysfunction), fresh frozen plasma (hemodilusion), and cryoprecipitate. The preoperative evaluation, must discern the acuity and etiology of the existing renal impairment and ongoing therapies. Associated acid-base and electrolyte abnormalities must be corrected, along with evaluation/estimation of the intravascular volume status. Preexisting neurologic disease (stroke, hemorrhage, transient ischemic attacks), including significant carotid stenosis, are considered important predictors of postoperative neurologic injury. Therefore, a detailed history and a neurologic exam, as well as carotid imaging (as indicated), are warranted for patients undergoing CPB. The risk of postoperative stroke is additionally increased by age, hypertension, diabetes, and concomitant cardiac surgery (mitral and CABG surgery, double valve procedures, etc.). The most common endocrine concerns include diabetes and hypothyroidism. In addition, endocrine suppression may be present in patients receiving chronic glucosteroid therapy. Unfortunately, most patients requiring mitral valve surgery (with exception of acute MR) have undergone chronic adaptive cardiovascular and cardiopulmonary changes (over several decades) from the primary valvular lesion and are referred for surgery only after medical management has failed. Thus, very few additional risk contributors are amenable to modification or reduction. Nevertheless, there are few strategies such as smoking cessation, weight reduction, and compliance with medications for blood pressure control, diabetes management, and optimization of fluid overload. Management of chronic MR consists primarily of afterload reduction, anti-ischemic therapy (antiplatelet agents, beta-blockers, angiotensin-converting enzyme [ACE] inhibitors and angiotensin receptor blockers [ARBs], antiarrhythmics, and diuretics). All such medications should be continued until the day of surgery. Whereas continuation of long-acting ACE inhibitors has been debated in the past, recent data suggests that this class of drug is not associated with significant vasoplegia to warrant its discontinuation. Also debatable is the timing of stopping antiplatelet therapy in those with ischemic heart disease treated with drug-eluding stents. In the management of chronic AF in patients with MR and MS, warfarin (coumadin) anticoagulant therapy is a frequent practice and should be discontinued and transitioned to intravenous heparin several days prior to surgery. If the INR level is above 1.5 at the time of surgery, vitamin K 1-2 mg IV may be given. When correction of INR is required urgently, both iv vitamin K and fresh frozen plasma should be administered. In the setting of mitral valve surgery for bacterial endocarditis, it is critical to continue the appropriate antibiotics perioperatively. Please refer to chapter on Mitral Valve Repair. Patients who have heparin-induced thrombocytopenia (HIT) or history of HIT provide additional challenges in mitral valve surgery with CPB. One treatment option is to delay surgery until antibody titers become undetectable (usually after 3 months). Alternatively, direct thrombin inhibitors (DTI) including bivalirudin, Lepirudin, and Danaparoid may be used. Rarely, patients who experienced a protamine reaction during a previous cardiac surgery may return for a “redo” mitral valve surgery. The protamine reaction is associated with bronchospasm, pulmonary hypertension, RV failure, and hypotension. As with HIT, management of these patients are subject to much uncertainty, with most sites opting to heparinize and reverse with protamine and not introduce alternative approaches that are unproven and, perhaps, add more risks. Antibiotic prophylaxis for surgery consists primarily of a cephalosporin and should be given within 60 minutes before skin incision. Additional doses are required after conclusion of CPB. In penicillin allergic patients, vancomycin is given by slow iv infusion. Dosage is based on weight (15 mg/kg) with a maximum dose of 1.5 g. Please refer to the Mitral Valve Repair chapter for additional details. In general, use of opioid in combination with inhaled anesthetic agent is preferred (refer to section on Mitral Valve Repair). Several important considerations related to airway management (single-lung isolation) have been discussed. Heart rate and rhythm: A significant number of patients presenting for mitral valve surgery will have atrial fibrillation or a history of supraventricular tachyarrhythmia. Thus, rate control is the principle goal and not rhythm control, unless the underlying rhythm is associated with hypotension and poor cardiac output. A normal to high-normal sinus rhythm is desired – both bradycardia and tachycardia should be avoided. Bradycardia may further cause ventricular dilation and compromise cardiac output. In some cases, the MR may worsen with bradycardia. Preload: Increased preload is a hallmark of MR (Figure 4). As such, the management goal is to lower preload, doing so without compromising cardiac output. The nitro vasodilator and diuretics work well in this setting. Important, as indicated, use of inotropes and afterload reduction strategies (pharmacologically or with IABP) also affects preload by increasing forward stroke volume, thereby decreasing the end-systolic volume and subsequent end-diastolic dimension. Afterload: Afterload reduction is an obligatory therapy in the medical management of MR. With rising afterload, the severity of MR increases – worsening symptoms and signs of MR. Most anesthetic agents tend to lower afterload. In fact, the severity of MR is often underappreciated while patients are undergoing general anesthesia. Short-acting arterial vasodilators are effective in lowering afterload. Contractility: It is unusual to initiate inotropic support before the start of CPB; whereas, its use is very common and needed following CPB. This is particularly true in patients that present with some element of ventricular dysfunction. Once the mitral valve has been replaced, the LV has to overcome “all” the afterload before ejection commences. (Prior to replacement or repair, there is no effective insovolumetric contraction phase as the MR lesion physiologically lowers the afterload during systole with retrograde volume being ejected into the LA; Figure 4.) Inotropic support is of great import in advance stages of MR with associated pulmonary hypertension and RV dysfunction. Heart rate and rhythm: Similar to MR, tachyarrhythmia is common and poorly tolerated in MS. In fact, increase in heart rate correlates directly with rise in pressure gradient between the ventricle and the atria. The goal is to maintain sinus rhythm whenever possible, albeit most patients will have chronic AF, requiring rhythm control. Several agents may be used, including beta-blockers, calcium channel blockers (cardizem), and digoxin as indicated. Afterload: Management of afterload also requires a delicate approach and is most relevant for the RV. That is, reduction of pulmonary hypertension is an integral and a must step in treating RV dysfunction. This is usually addressed during and after separation from CPB. Commonly used technique involves use of milrinone (providing inotrope and afterload reduction) alone or as an adjunct to epinephrine. For more severe cases of right ventricular dysfunction, additional vasoactive agents may be required (norepinephrine and vasopressin), as well as inhaled nitric oxide and/or IABP. In surgery, especially, after CPB, systemic afterload is often reduced; hence, the need for the vasopressors. Preload: In late stages of MS, the lesion is much more complex, in terms of preload management, because the LA has volume overload and so does the RV. In contrast, the LV is generally under-filled (Figure 13). Optimization of preload must be done carefully as not to cause CHF but, at the same time, not to undertreat and compromise left-side cardiac output. Use of traditional surrogates of preload (central venous pressure, pulmonary artery diastolic pressure, and pulmonary artery occlusion pressure) are often inadequate and can be misleading because the measured pressures are not indicative of left ventricular end-diastolic pressure or volume. Pressure volume loop in mitral stenosis, demonstrating reduced left ventricular size and end-diastolic volume (shaded area). Contractility: RV dysfunction and management must be recognized and appropriate management planned to include the aforementioned strategies. Of note, LV function is well preserved in MS, except for rare cases of rheumatic disease involving the ventricle. Surgically, the mitral valve can be approached from several directions via the LA, LV, or even transmyocardially. Surgical incisions have varied from full sternotomy down to percutaneous access only, with less invasiveness usually requiring a trade-off versus effectiveness or ease of application. The mitral valve sits between the LA and the LV, and can therefore be approached from either of those two chambers, or, potentially, through the cardiac wall without entering a cardiac chamber. At present, nearly all surgical access to the mitral valve is through the LA because of the large LA cavity size and the safety of cutting the thin LA wall. The LA itself can be accessed through the inter-atrial groove, the right superior pulmonary vein, the dome of the LA, the inter-atrial septum, and the LA appendage. Most surgical treatment of MR is performed through the inter-atrial groove of Sondergaard. Another popular approach to the LA and mitral valve is through the inter-atrial septum via the right atrium. This is an inherently anterior approach suited to median sternotomy or anteromedial thoracotomy. To access the anatomic approaches to mitral regurgitation listed above, several skin incisions have been used, including sternotomy, thoracotomy, or percutaneous access. With the wide use of cardiopulmonary bypass in the 1960s, median sternotomy replaced right thoracotomy as the primary surgical approach to treat MR. Relative to thoracotomy, median sternotomy has advantages of reliability, speed, and excellent access to allow most any procedure on the heart. The skin incision for full sternotomy can be made as small as 8 cm in many patients and can be made as a more cosmetic infra-mammary incision in women (Figure 5). Disadvantages to the median sternotomy include blood loss, slow sternal healing, potential for sternal nonunion, and morbidity and mortality from deep sternal infection, which may affect 1% to 2% of cases. Median sternotomy for minimally invasive mitral valve surgery. The incision is less than 8 cm in length, providing a much better cosmetic result. Partial superior sternotomy has been the most popular minimally invasive approach to mitral valve since the work of Cosgrove et al. 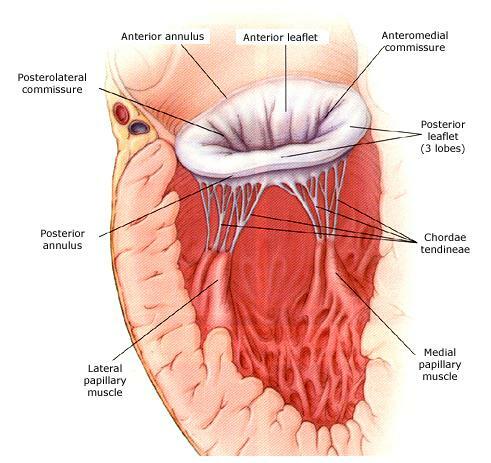 Here, the mitral valve can be approached through the inter-atrial septum or through the inter-atrial groove. The partial superior sternotomy has advantages of less blood loss, faster recovery, and smaller incision than full sternotomy, with disadvantages of less ability to perform CABG surgery and longer clamp and procedure times. Before median sternotomy, mitral operation for regurgitation was performed via right thoracotomy by Lillehei in 1956. From a full right anterolateral thoracotomy, the ascending aorta can be cannulated but not easily replaced. The superior and inferior vena cavae and the right atrium are also accessible. Advantages relative to sternotomy include avoidance of sternal reentry in patients with prior sternotomy, less bleeding, less infection, faster recovery, and absence of sternal nonunion. Disadvantages include little access to most coronary arteries, increased pulmonary morbidity, more pain, and limited access to the aorta and aortic valve. As peripheral cannulation and other instrumentation have improved, several authors described smaller right thoracotomies termed “mini” thoracotomy or “port access.” The incision length is somewhere between full thoracotomy (20 cm) and an endoscopic port (0.5-1.5 cm). Mini-thoracotomies share the same advantages as full thoracotomy, with additional advantages of yet faster recovery, less bleeding, and less infection, with lung trauma and pain similar more similar to sternotomy. Disadvantages are increased operative difficulty, increased procedure and pump times, and potentially more equipment costs. Figure 6 illustrates a commonly used right mini-thoracotomy. Right thorocotomy for mitral valve surgery used in minimally invasive mitral valve surgery. The successful first mitral valve operation was a closed mitral commissurotomy performed via a left thoracotomy by Cutler in 1923. Through the left thoracotomy in the fourth intercostal space, the mitral valve is usually approached via the LA appendage. Because the unfavorable orientation of the mitral valve, the left thoracotomy approach is generally adequate only for either annuloplasty or mitral replacement. Open (on CPB) or closed (without CPB) mitral commissurotomy can readily be performed via the LA appendage from the left thoracotomy approach. The availability of percutaneous balloon mitral valvuloplasty has minimized the volume of surgical mitral commissurotomy, but the left thoracotomy approach can be of value in patients with both prior sternotomy and prior right thoracotomy. To patients and to most surgeons, the term totally endoscopic has generally implied no incision larger than the port for a 0.5- to 1.5-cm endoscope. However, in cardiac surgical circles, totally endoscopic has also been used to describe a right mini-thoracotomy in the 4- to 8-cm range with no rib spreading. Totally endoscopic mitral valve surgery with no chest incision over 1.5 cm has generally required robotic assistance and groin incision for femoral arterial and venous access. Totally endoscopic mitral replacement is not feasible with current prostheses as none fit through a 1.5-cm port. Future percutaneous technology might eventually allow totally endoscopic mitral replacement. The only commercially available percutaneous approach to mitral regurgitation in the United States today is the MitraClip (Abbott Vascular, Redwood City, CA). This is a 13-mm clip that is applied to attach the anterior and posterior mitral leaflets together, similar to the surgical edge-to-edge surgical repair technique (Figure 7 and Figure 8). The MitraClip is placed from a sheath in the femoral vein and is passed through the inter-atrial septum. EndoClip used during percutaneous approach in minimally invasive mitral valve surgery. Note the transmitral position of the device grasping the anterior and the posterior mitral leaflets. 3D image of a mitral valve repair using a Mitralclip system. The central edges of the mitral leaflets have been clipped together in the center, resulting in two transmitral openings for blood flow during diastole from the atrium into the LV. Essentially all surgical approaches to mitral regurgitation today require the assistance of CPB – the percutaneous MitraClip being the only exception. Standard median sternotomy allows direct cardiac cannulation for CPB, generally with cannulation of the ascending aorta and the superior and inferior venae cavae. Any incision other than full median sternotomy may tend to employ peripheral cannulation for CPB because of limited access to the heart provided by these other approaches. The femoral veins can be accessed percutaneously or via cut-down using cannulas that pass through the right atrium into the superior vena cava to drain the right heart. Peripheral arterial access can come from the femoral arteries or the right axillary artery. Central cannulation of the aorta and venae cavae may be preferred when possible to avoid the need for additional incisions, to minimize risk of peripheral vascular injury, and to minimize risk of stroke from retrograde perfusion of the thoracoabdominal aorta. The Endoclamp: The EndoClamp aortic catheter is indicated for use in patients undergoing CPB. The EndoClamp catheter occludes the ascending aorta, vents the aortic root, and allows delivery of cardioplegia solution to arrest the heart. The pressure lumen allows monitoring of the aortic root pressure (Figure 9). The EndoClamp catheter for occluding the aorta and for delivery of cardioplegia and venting. Note the inflated balloon at the tip of the catheter for aorta occlusion and the three side-ports: yellow for cardioplegia delivery and venting of the aorta and the other two ports for balloon inflation/deflation and for monitoring aortic pressure. The EndoClamp aortic catheter is 10.5 Fr, wire-wound, triple lumen catheter with an elastomeric balloon near its tip for occluding the ascending aorta. The large central lumen of the catheter serves two functions: delivery of cardioplegia solution to the aortic root and venting of fluid and air from the aortic root. The two remaining lumens serve as conduits for balloon inflation and aortic root pressure monitoring. Venous cannula: The QUICKDRAW venous cannula serves to drain nonoxygenated blood from the vena cava and right atrium during CPB (Figure 10). The venous cannula kit includes a wire-wound cannula, introducer(s), guidewire, connector hub and percutaneous insertion kit. The cannula and introducer(s) have tapered tips to aid in insertion and advancement into the femoral vein. The QUICKDRAW venous cannula serves to drain non-oxygenated blood from the vena cava and right atrium during cardiopulmonary bypass. It is inserted into the femoral vein and advanced up into the inferior and superior vena cava. The EndoPledge Sinus Catheter for occluding the coronary sinus in order to retrograde perfuse the coronary circulation. The catheter is inserted via the internal jugular vein by the anesthesiologist, with TEE guidance. It has three ports: a balloon port, a pressure port, and a larger port for cardioplegia delivery and maneuvering of a stylet. Robotics: Robotic assistance for mitral valve surgery first became available using a remotely controlled servo mechanism in 2000 and has been championed by Mohr, Chitwood, and others. Although many robotic devices have been used, only one manufacturer has a robotic device available in the United States (Figure 12 [daVinci, Intuitive Surgical, Sunnyvale, CA]). The daVinci robot is a remotely controlled servo, where one or two operating surgeons sit at a console away from the patient and manipulate 2 to 4 servo-controlled arms. The robotic arms offer scaling, where the instruments move smaller distances than the operator’s hands, along with tremor reduction. The 1.5 cm camera is binocular, offering stereoscopic vision along with 10X magnification. The daVinci robotic system depicting the remotely controlled servo and the servo-controlled arm. Robotic assistance can be used on any surgical procedure, but the real merit to robotic assistance comes when the surgical incisions are reduced sufficiently to prevent facile operating directly through the mini-thoracotomy. Disadvantages of a robotic approach include equipment cost and complexity, size and bulk of current technology, and difficulty with knot tying. Mitral replacement had long been the standard surgical treatment for mitral regurgitation. Nearly 30 years of experience with modern mitral repair has now prompted mitral repair to be favored over replacement in most patients. However, many studies have now shown that mitral replacement with chordal preservation nearly eliminates the risk of ventricular-annular disruption and minimizes impairment of LV function. Preservation of the posterior chords provides the protection against ventricular-annular disruption and provides most preservation of LV function, but additional preservation of the anterior chords provides additional benefit in LV function. In fact, to date, no definitive data exist to say that mitral repair has advantage over chordal sparing mitral replacement, beyond the inherent issues of anticoagulation versus limited biological durability. Mitral replacement does have some inherent advantages over repair. The elimination of mitral regurgitation is more certain with replacement, especially when the quality of repair is in question. Elderly patients with limited life expectancy may have little issue with anticoagulation or limited durability using modern bioprostheses. Routine American Society of Anesthesiologists (ASA)–recommended monitoring, as well as invasive hemodynamic monitoring, is required for mitral surgery, including an arterial catheter. Whether a pulmonary artery catheter is used is highly debatable; however, a multiport central venous catheter should always be placed. The use of intraoperative TEE is now a standard of care for mitral valve repair and is discussed in detail in the chapter on Mitral Valve Repair). Nienaber, JJ, Glower, DD. “Minitransseptal versus left atrial approach to the mitral valve: a comparison of outcomes”. Ann Thorac Surg. vol. 82. 2006. pp. 834-9. Webb, JG, Wood, DA, Ye, J. “Transcatheter valve-in-valve implantation for failed bioprosthetic heart valves”. Circulation. vol. 121. 2010. pp. 1848-57. Dogan, S, Aybek, T, Risteski, PS. “Minimally invasive port access versus conventional mitral valve surgery: a prospective randomized study”. Ann Thorac Surg. vol. 79. 2005. pp. 492-8. Modi, P, Hassan, A, Chitwood, WR. “Minimally invasive mitral valve surgery: a systematic review and meta-analysis”. Eur J Cardio-Thorac Surg. vol. 34. 2008. pp. 943-52. Chitwood, WR, Rodriguez, E, Cohn, LH. “Minimally invasive and robotic mitral valve surgery”. 2008. pp. 1079-100. Alfieri, O, De Bonis, M. “The role of the edge-to-edge repair in the surgical treatment of mitral regurgitation”. J Card Surg. vol. 25. 2010. pp. 536-41. Carpentier, A, Adams, DH, Filsoufi, F. “Reconstructive Valve Surgery”. 2010. Tamburino, C, Ussia, GP, Maisano, F. “Percutaneous mitral valve repair with the MitraClip system: acute results from a real world setting”. Eur Heart J. vol. 31. 2010. pp. 1382-9.